When rock promoter Chet Helms passed away in 2005, it was a very sad day in San Francisco. Considered by many as the father of the Summer of Love festivals of 1967, Chet oversaw Family Dog Productions, and was directly responsible for bringing Janis Joplin from Texas to California, where she became famous as the lead singer of Big Brother & the Holding Company. 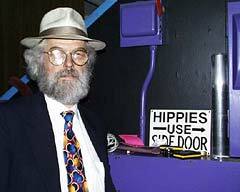 To celebrate his passing, a big tribute concert was assembled at the Great American Music Hall on July 29, 2005, featuring a lot of musicians that credited Chet for much of their success, including members of the Grateful Dead, the Jefferson Airplane, and Big Brother & the Holding Company. With a keen pulse for the good stuff, the Octalouie team was solicited to document this event for posterity, producing some excellent video programming that will eventually be distributed to celebrate the legacy of this great human being.